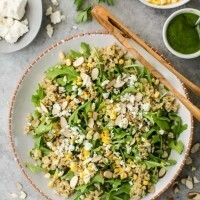 Freekeh Salad with Sweet Corn and Arugula | Naturally. In the past few weeks, my lunch routine has revolved around salads of all kinds. It’s usually a catch-all for whatever I have floating in the refrigerator. Leftover grilled vegetables, cheeses, cooked grains, and nuts are usually my go-to salad toppings. This freekeh salad is the culmination of weeks of salads. For those unfamiliar with freekeh, it’s a type of cracked wheat. 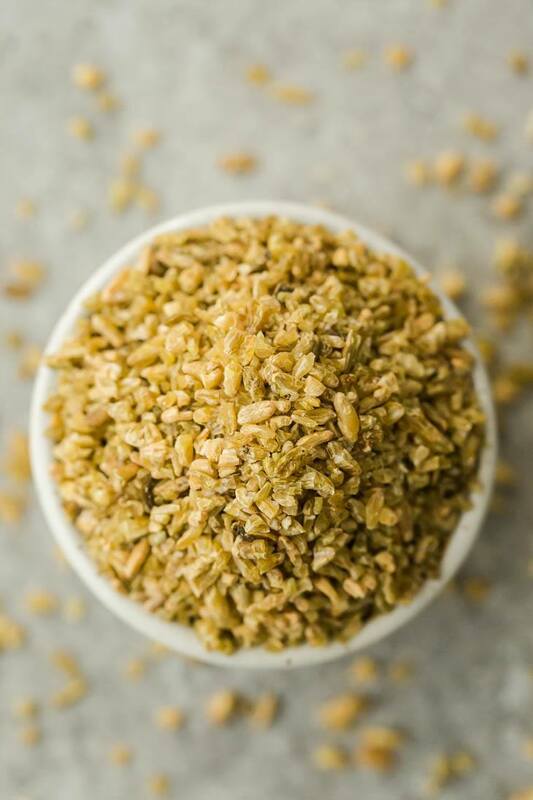 Freekeh is picked while the wheat is still young and green, roasted, and then cracked into smaller pieces. This is simplifying the process quite a bit but this video is fun to watch to explain a bit more. The overall flavor is nutty but also has just a bit of smoked flavor thanks to the roasting process. If you’re interested in trying this grain out, Bob’s Red Mill carries it online. This freekeh salad is really one of my favorites. The toasted flavor of the freekeh makes for a lovely companion with the fresh taste of sweet corn. I mention this in the comments of the recipe but I feel like it’s worth mentioning here as well. 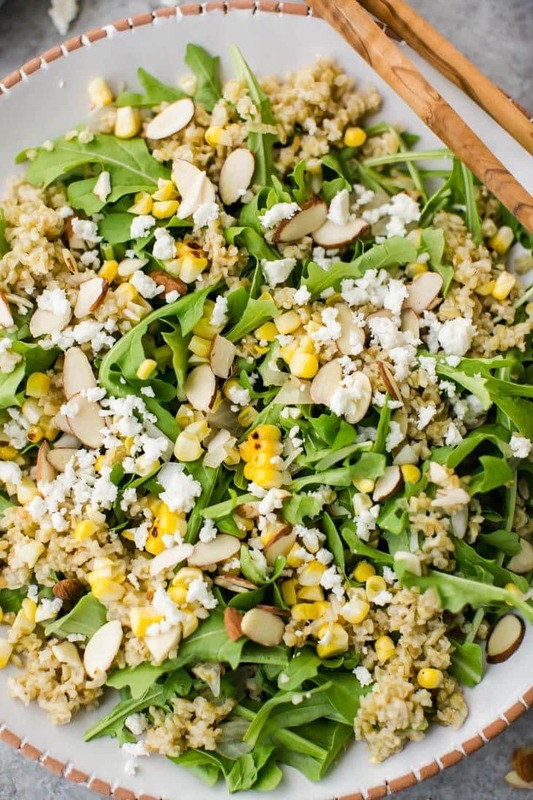 I love arugula but it can easily overpower the flavor of this freekeh salad. If you aren’t sure about arugula, use lettuce or spinach. Also, this dressing is a bit on the creamier side- adjust the liquids to your liking. 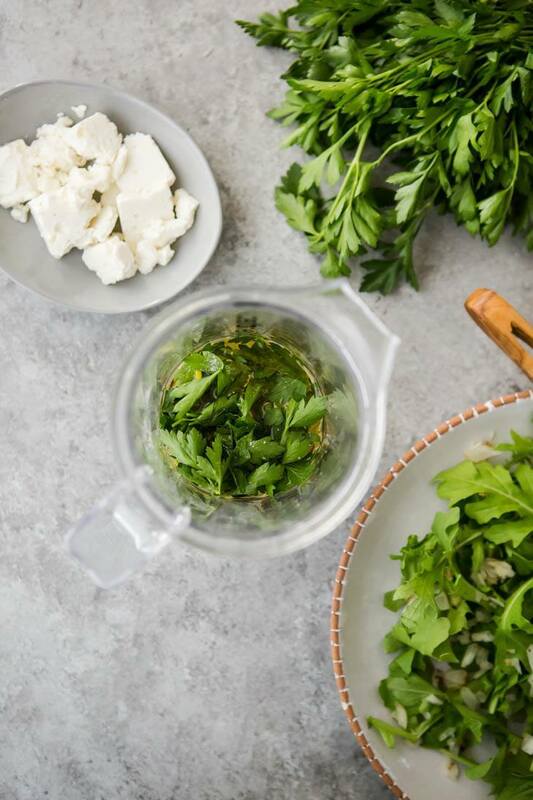 Or if you don’t want to use a blender and leave it as a vinaigrette, whisk the liquids together then stir in parsley that has been finely minced. In a small pot, bring 1 1/4 cup of water to a boil with a pinch of salt. Add the freekeh, reduce to a simmer, cover, and let cook for about 20 minutes. Nearly all the water should be absorbed. Turn off heat and let sit while preparing the salad. Light grill or heat grill pan over medium-low heat. Remove husk and silk from the corn and cut onion into thin slices. Brush both with olive oil and grill until both are lightly charring. Remove from heat, dice onion, and remove kernels from corn cob. 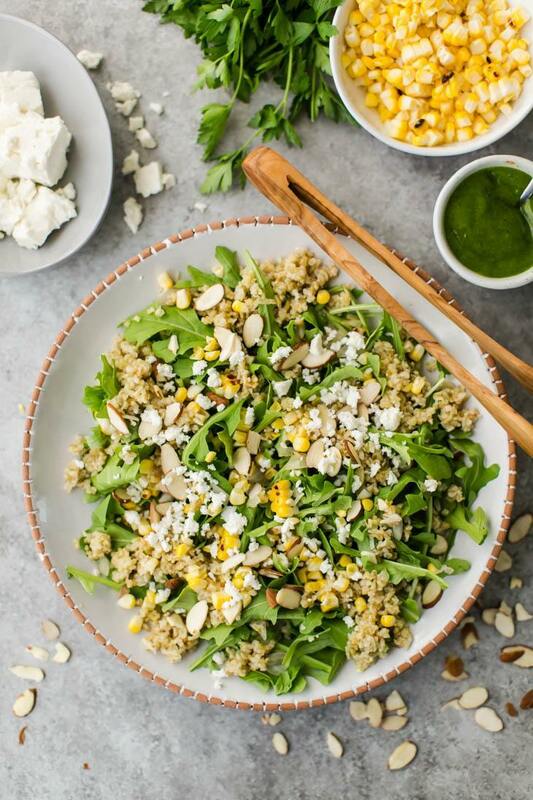 Toss cooked freekeh with arugula, diced onion, corn kernels, almond slices, and feta. To make dressing, combine ingredients in a blender and puree. Add more olive oil if dressing is too thick for your liking. While I love arugula in this salad, the peppery taste may be too overwhelming for some. Try using other greens with a more low-key flavor profile, like spinach. This looks so yum! I’ve been looking for good salad ideas that use corn. Never would’ve come up with arugula on my own, but now that I’m imagining it, it sounds totally dreamy. This salad is looking freekeh! (hehe) In al seriousness, it looks incredible! This looks like it is very tasty! I love corn in salads. This looks delicious. I will definitely be trying this. Such a pretty summer salad! Looks freekeh-n good! Another irresistible summer salad to try… beautiful! Yay! Beautiful grain salads like this are my favorite. 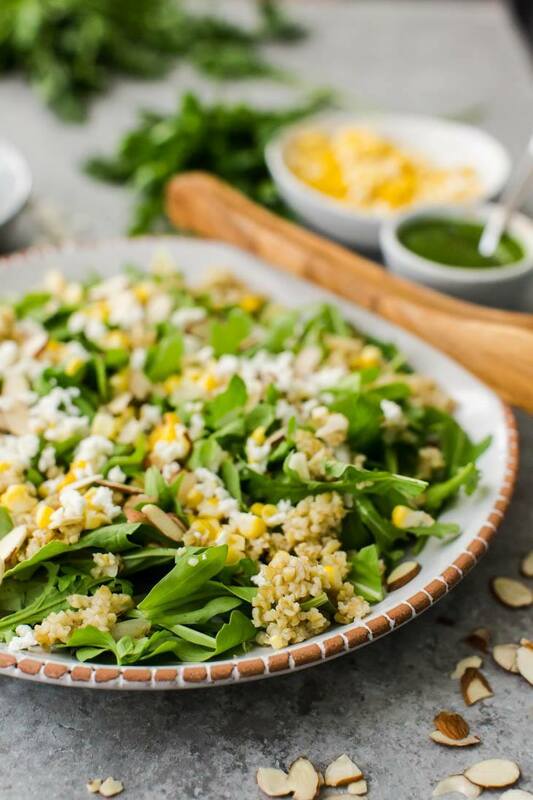 The punch of arugula sounds like it would go so well with fresh sweet corn! Hi Erin! Grilling corn – I have to say that I grilled corn yesterday for Black Bean Tacos for the Grilled Zucchini summer variation in your cookbook. And those tacos were great! So much tastier than the tacos with seasoned ground beef that I grew up eating. The corn relish was excellent too. Every bean and kernel of corn was eaten, nothing was missed! I love the premise of the cookbook. I like to switch up recipes, especially as different fruits and vegetables come into season. I made the savory turnovers with the spicy rhubarb lentils and loved them. That got me thinking about other variations (like you gave me permission) and I made them again with caramelized onions and chard. So good with a simple green salad. And the enchilada recipe! It feels like with your help I have cracked the code on enchiladas. I’ve got the sauce, and the filling and the assembly down now, and I can have them whenever I want. Finally! I’ve tagged so many other recipes in your cookbook. Looking forward to more. Thanks! Yum! A great recipe for a summer salad, I’ll have to try it. I can never have too many corn recipes and seeing that I’ve never cooked freekah before (I think I’d heard of it… Though I might be making that up) this is one I know I need to try.